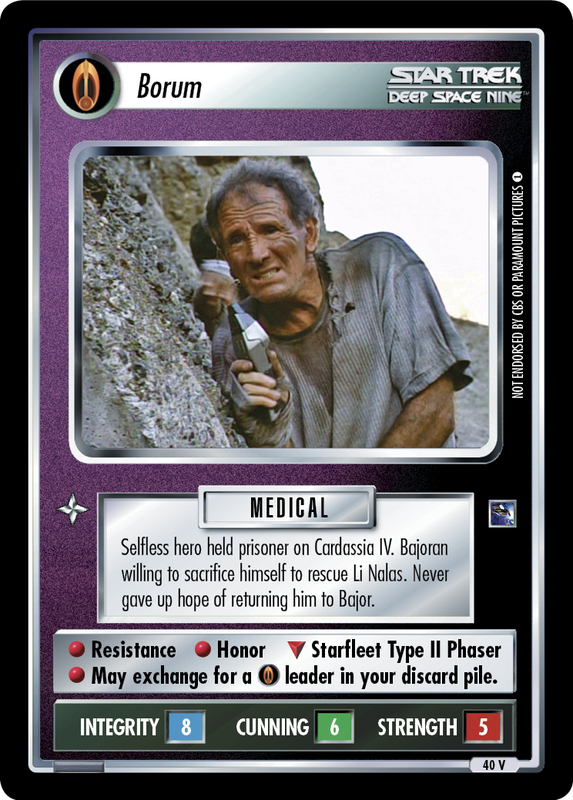 Selfless hero held prisoner on Cardassia IV. Bajoran willing to sacrifice himself to rescue Li Nalas. Never gave up hope of returning him to Bajor. May exchange for a leader in your discard pile. Characteristics: "Reshape the Quadrant"-related cards, affiliation, manipulate your discard pile, Prisoner, Resistance, Bajoran species. If you play OTF this card replaces the backward compatible 2E card Borum, Selfless Hero from Energize - ST1E compatible (the 2E card is no longer valide in OTF). Card logging info: First edited by Telak at Dec 16th, 2013. Please support openCards and validate game text of this card!